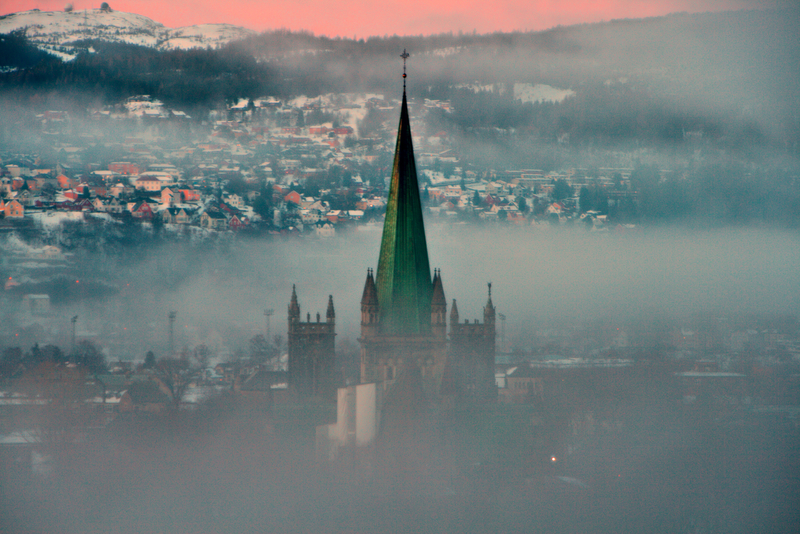 The city of Trondheim in Norway was the most northern pilgrimage site for medieval Christians. The patron saint of Norway, King Olav Haraldson, who brought Christianity to Norway, was buried here in 1030. He was declared a saint shortly afterwards, and pilgrimages to his shrine started at once. The Nidaros Diocese of the Lutheran Church of Norway, Trondheim, is a founder member of the European Green Pilgrimage Network. It was also a founder member of the Green Pilgrimage Network, launched in 2011, alongside the city of Trondheim and the National Pilgrimage Centre, Norway. provide clean drinking water for all pilgrims. The ancient, holy city of Trondheim is the final destination of pilgrims travelling on St Olav's Way, the name given to the network of historic pilgrim routes culminating at Nidaros Cathedral and the shrine of St Olav. He was King of Norway from 1015 to 1028 and made a saint in 1030. The main route is around 640km (400 miles) long, and starts in Oslo, heading north over the Dovrefjell mountains, to end at Nidaros Cathedral. This was the northernmost pilgrim goal in the Christian world in the Middle Ages. In recent years, it has been revived by modern pilgrims. Hope in a Pilgrimage of Justice and Peace formed the integral thread for proceedings at the June 2016 meeting of the Central Committee of the World Council of Churches (WCC) in Trondheim, Norway – an important Christian pilgrimage site and home to the northernmost medieval cathedral in the world. The 2016 meeting 'Pilgrimage: Discerning the Landscapes Together', included a powerful statement for peace and justice in Israel and Palestine. Dr Agnes Abuom, from the Anglican Church of Kenya, urged member churches to be catalysts for change in 'a rapidly changing and increasingly pluralistic world', adding: 'the pilgrimage offers us immense possibilities to re-imagine ourselves as a movement of God's people in the mission – open and inclusive, and agile and receptive to the promptings of the Spirit'. Europe's 32 Cultural Routes by the ​Council of Europe. Trondheim is Europe's new 'pilgrim hotspot', according to a 2012 BBC report about thousands of people at a festival to remember Scandanavia's most famous saint, Olav. The festival also marked the 50th anniversary of the pilgrimage being revived. 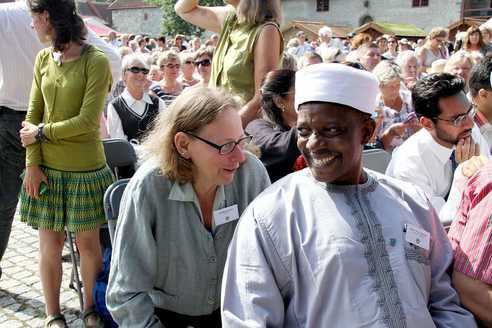 Trondheim hosted the second meeting of the Green Pilgrimage Network in July 2013, attended by 90 religious and secular leaders from China, Japan, India, Palestine, Israel, Mexico, Nigeria, Armenia and many European countries including the UK, Spain and Sweden. With thanks to Creative Commons photographers. Picture credits, from top, left to right: Nidaros Cathedral, Trondheim, by Christopher DavGoss; Nidaros Cathedral, by Christian Haugen; Pilgrim's route by Ole Husby; Nidaros Cathedral, by Mickey Bo; St Olav's trail, by Lynn D Rosentrater; ​Pilgrims, by Lynn D Rosetrater; 2nd Green Pilgrimage Network meeting, Trondheim, by ARC.